Olympus has announced a new compact digital camera in their mju TOUGH series. The camera is called Olympus mju TOUGH-6010 and feature a 12 megapixel sensor, “magic filters”, and is shockproof, freeze proof and waterproof. The Olympus mju TOUGH-6010 will be available in July 2009 and cost about £300. With the Olympus µ TOUGH-6010, photographers never have to worry about going where a camera can’t take the knocks. In addition to being freezeproof to -10 C, it is waterproof to 3m* and provides shockproof protection against drops of up to 1.5m**. The versatile 3.6x wide optical zoom (28-102mm***) seen on the TIPA award winning µ TOUGH-8000 is also on board for great group photos or close-ups of distant subjects. To make those shots even more memorable, the µ TOUGH-6010 now features inspiring Magic Filters. By applying Pin Hole, for example, images will seem to have been taken with a traditional pin hole camera. Pop Art, Fish-Eye, and Sketch add interesting effects of their own. What’s more, Dual Image Stabilisation keeps images blur-free even in rough and tumble environments. And so you’re always ready for that perfect shot, a practical Tap Control mode gives even gloved-hands easy access to a range of settings which can be viewed on the 6.9cm/2.7” HyperCrystal III LCD. The display’s new “triple coating” protects it against reflection, scratches, and moisture to ensure comfortable shooting on the ski slopes and under water. Since you don’t get a second chance for the perfect shot in the heat of the action, the µ TOUGH-6010 also boasts a range of clever functions. Delivering perfect images of once in a lifetime moments i-Auto Mode, for example, automatically adjusts camera settings to one of five recognised commonly-used scenes. In addition, Advanced Face Detection Technology detects up to 16 faces for consistent quality across group portraits. And for a flawless look under tough conditions, Beauty Mode is on hand to smooth out imperfections and leave subjects looking refreshed. The shockproof, waterproof, and freezeproof µ TOUGH-6010 is a sturdy and reliable companion that will meet any challenge. 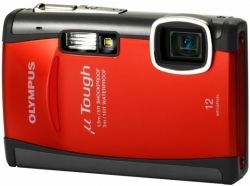 It arrives in stores in July 2009 along with a new software version: Olympus Master 2.2 for more image management and editing possibilities. Advanced Face Detection of up to 16 persons for perfectly focused and exposed faces. In combination with Shadow Adjustment Technology other main parts of the picture are also correctly exposed. A technology that searches for faces in a composition and recognises them as the main subject. It then automatically puts them in focus and optimally adjusts exposure to create an image that’s sharp in the right places and ideally exposed. Advanced Face Detection Technology can detect up to 16 faces. Beauty mode touches up the appearance of subjects even while the shot is being taken. This feature recognises faces and automatically makes skin on the face and adjacent areas appear smoother, brighter and more youthful. Providing two-fold protection, this special function helps to avoid image blur caused by camera shake or fast-moving subjects. It combines high ISO values with a CCD-based mechanical image stabiliser, where a built-in gyro sensor detects camera movement and adjusts the CCD accordingly. This “intelligent-Auto” mode uses advanced automatic detection technology to allow the camera to recognise the five most commonly used scenes automatically. They enable the capture of perfect photos without any need for manual settings. Enables special artistic effects to be created directly in the camera. Fish-Eye: Reproduces the dramatic effect of a fish eye lens, lending a new perspective to the whole scene with a “round” effect. Sketch: Gives the impression that subjects have been sketched by an artist by transforming images into line drawings. A special attachment comes bundled with this camera which provides for microSD card compatibility in addition to being able to use xD-Picture Cards. “TAP Control Mode” is a unique interface that lets users access a range of camera functions by simply tapping on the camera body. Quick View mode, Scroll Playback Pictures and a user-defined function (Flash or SAT) can be accessed by tapping at particular points of the camera.